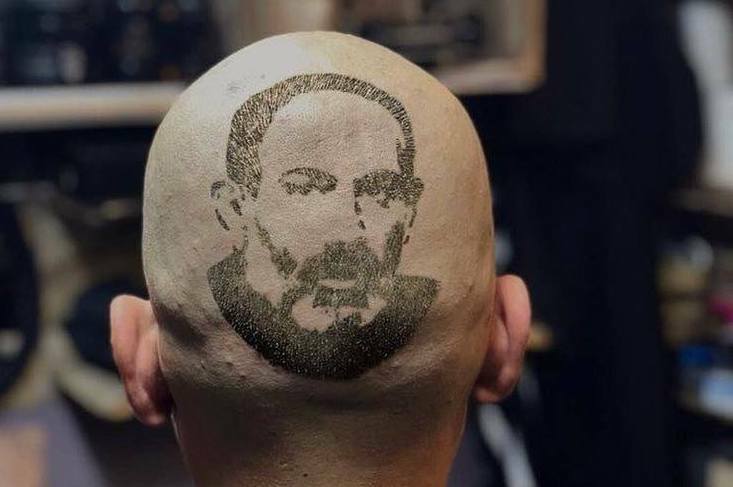 A man with an image of Armenian Prime Minister Nikol Pashinyan shaved into the back of his head. The image is part of the Facebook collection of Ruben Muradyan, who is documenting what he calls a nascent cult of personality around the premier. Since taking power in May, Prime Minister Nikol Pashinyan has become wildly popular in Armenia; both for uprooting the deeply hated regime that had ruled Armenia for a decade and for doing it in his dynamic, media-savvy style, unprecedented in Armenian politics. That adoration also has spawned what some have identified as a nascent cult of personality. Pashinyan’s image now graces T-shirts, cakes, candles, iPhone cases, and other mass-produced memorabilia sold across Yerevan. A pop song titled “Nikol Pashinyan” and calling the prime minister “a national hero” has over 7 million views on YouTube. With Pashinyan’s avowed agenda of rejecting the authoritarianism of the past and moving toward liberal democracy, a worry has arisen about the future of the country where so much hope is placed in a single man. In private conversations, some Armenians are increasingly expressing deep embarrassment about the over-the-top expressions of Pashinyanmania. “When it all started in April-May, I looked at the folk art glorifying Pashinyan with curiosity,” Muradyan told Eurasianet. In July, though, he saw footage from a kindergarten event where a little boy, dressed in Pashinyan’s signature baseball cap, camouflage t-shirt, and backpack, marched with a group of “supporters” and sang revolutionary songs. “That was a turning point for me,” Muradyan said. “I started looking into what’s going on with all these expressions of popular love.” That’s when he started his Facebook chronicle. “I'm 41 years old, and I was fourteen in 1991,” Muradyan said. “I've never seen anything like this in the history of Armenian politics. Kids had never sung songs about Levon Ter-Petrossian,” the first president of independent Armenia who for a time also enjoyed very high approval ratings. An adaptation of the pop song Despacito, rewritten as a paean to Nikol Pashinyan. “Only Nikol is worthy of being our Prime Minister,” the lyrics say. Сегодняшняя Дискотека начинается с революционного перепева Desposito. Muradyan says that his long-time interest in the history of Stalin’s rule in the USSR has informed his sensibility toward the phenomenon. And while many of the popular manifestations of enthusiasm are funny, he is concerned by signs of official support of the cult of personality. He cited the example of a book about Pashinyan, titled “Savior from the Planet Ijevan” (the prime minister’s hometown) and published with the support of the Ijevan municipal government. After a public backlash, all mentions of the books were deleted from the municipality website and social media accounts. The national government, too, has joined in. In July, Armenia’s Culture Minister announced an exhibition dedicated to the Velvet Revolution. The exhibit was supposed to be held at the National History Museum on Yerevan’s main square, though it hasn’t yet opened. “The irony is not lost on me: in Soviet Moscow, the Museum of Revolution was situated on Red Square,” Muradyan said. And in October, Armenia’s pavilion at the Frankfurt Book Fair in Germany — set up by the Ministry of Culture — featured a large poster promoting a book written by Pashinyan. The fact was made public through a photo posted by a deputy minister of culture. The photo drew criticism from Facebook users and was then deleted.